Groundbreaking for the athletic facility, April 10, 2019. 4/10/19 – After several years of planning and fundraising with help from Marshfield Area Community Foundation (MACF), community members celebrated as the next steps were taken this afternoon to fulfill a vision to have high quality, accessible and welcoming practice and playing fields to serve students and the entire Marshfield community for many years. 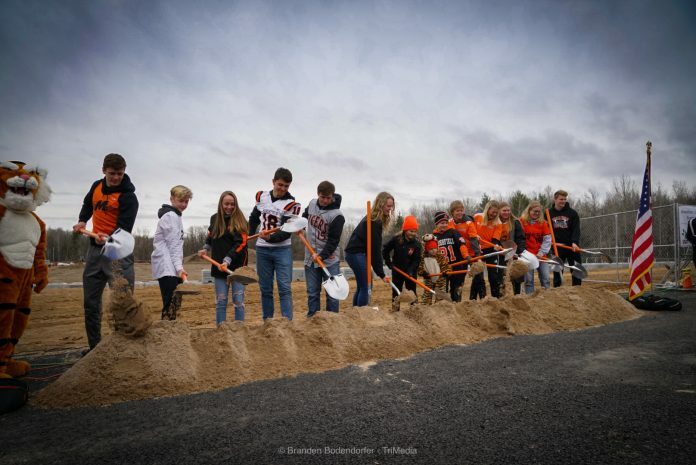 The Groundbreaking Ceremony for the Marshfield Community Athletic Facilities took place at 1:30 p.m. April 10. The stadium will be named in honor of donors Ken and Ardyce Heiting. “Our goal is now becoming a reality for the Marshfield community and the impact it will have on our education, athletics, and our community as a whole will be under-measured and understated for years to come,” said athletic director Nathan DeLany. The $10.5 million project is expected to be completed in fall 2019, and will include items such as concession and restroom areas which are handicap accessible, a synthetic sports turf surface for football and soccer, an eight-lane high school regulation track, designated spots for discuss, shot put, and bleacher sections that can hold up to 4,000 spectators. The baseball and softball diamonds will include spectator bleachers, dugouts, fencing, and fields large enough to support full size competitions. The total private fundraising amount including in-kind gifts was $7,738,000 achieved through gifts of $1 to $2.5 million from 550 donors, making it the largest project the community foundation has undertaken. “This project demonstrates what can happen when a committed team of parents, community members and school district staff set their minds on a project and make that happen for the good of our school district,” said Amber Kiggens-Leifheit, MACF Director and school board member. MACF would like to especially thank the following major donors: Ken and Ardyce Heiting, Hamus Family, Marshfield Tiger Booster Club, The JP Adler Family Fund, Ron & Robin Safford, The Harrington Family, Everett & Dolores Roehl, Arlon & Gail Haessly, Marshfield Area Community Foundation, Brad & Kendra Haessly, Trierweiler Construction & Supply Company, Forward Financial, 100 Extraordinary Women, and Team Schierl Companies: Subway, The Store, and Schierl Tire & Service.